AMHERST, N.Y. – Daemen College will open the academic year and officially welcome nearly 470 new students and their families at the Convocation 2017 ceremony scheduled for 3 p.m. Sept. 2 in the Wick Campus Center Dining Room, marking the first time the college has hosted this special event during welcome weekend. 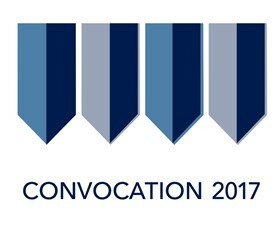 Convocation will feature remarks from Daemen President Gary A. Olson; Dr. Michael Brogan, vice president for academic affairs and dean of the college; Dr. Thomas Stewart, chair of the Daemen Board of Trustees; and others from the college’s administration, faculty, and student body. A reception will immediately follow in the Wick Social Room. The 2017 welcome on behalf of the Daemen College/Rosary Hill Alumni Association will be given by Roger Warren Rogers, DO ’98, an orthopedic spinal surgeon whose practice is affiliated with Mount St. Mary’s Hospital in Lewiston. Rogers received a bachelor’s degree in physical therapy from Daemen, and went on to earn a doctorate in osteopathic medicine from Lake Erie College of Osteopathic Medicine. During his medical career, Rogers obtained an orthopedic spine fellowship at the Texas Back Spine Institute, and has also worked at Millcreek Hospital, Seymour-Johnson, and Wright Patterson Air Force Base. Rogers, a Wheatfield resident, will be recognized with Daemen’s Advancement in Career honor at the 2017 Distinguished Alumni Awards ceremony taking place Nov. 3. He has received numerous other awards in orthopedics, physical therapy, and military service, including two Air Force Commendation Medals.